1. Hawaiian Tropic Silk Hydration After Sun Lotion - I stick with my spray-on sunscreen for any type of protection from the sun especially as we get older. I don't usually use any after-sun lotions so this was a first time trying this out. It has a coconut papaya scent added to it which is very tropical. The lotion has a slight greasiness to it which you can't really tell. I'm just picky when it comes to these lotions. Overall, not bad and it keeps the skin hydrated! 2. Covergirl LashBlast Bombshell Mascara - I love mascara! And so I was excited to give this one out from Covergirl a try. The top step is supposed to add volume to your lashes and the bottom step is to intensify. I thought it wasn't bad, it did give me some volume which is something I always look for in a mascara. I did have to use a lash curler but because that's just how my lashes are. Formula is not too wet and the wand helps make my lashes not clump up. 3. Sinful Colors Professional Nail Polish - I got yet another nail polish which I didn't really use. I am not a big into nail polish but the teal color that they had sent me was pretty! I am not familiar with the brand but have seen it around drugstores, the quality isn't bad for a $2 polish. 4. Jamba Juice All Natural Smoothie Kit - I didn't get a chance to take a picture of the smoothie kit I chose after redeeming the coupon. I ended up getting the Green Fusion Fruit & Veggie kit. I always enjoy a good green juice and how can you go wrong with Jamba? I think it's a quick and simple way of getting in your fruit and veggies servings! Just drop the ingredients into a blender and add your juice (I prefer carrot juice) and blend and serve! It's that simple! I would go towards this if I didn't have any fresh ingredients for a smoothie laying around. 5. First Aid Shot Therapy - When I first saw this in the box, I wasn't sure what the heck this was. After reading about it, I thought it was a pretty cool idea. A pain relief liquid aspirin 'shot' to help headaches/migraines if needed. I honestly have yet to try this product out still because I haven't had a headache bad enough to need this. But it's good to know there's an option. Well hope you enjoy my mini reviews for each product! Let me know in the comments which product would you want to try out. 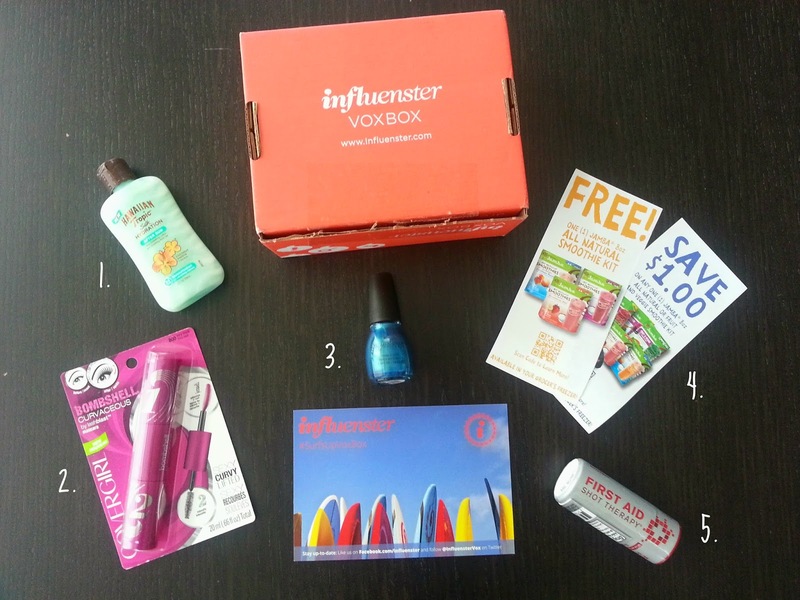 Looks like a great Influencer box! So fun! I love sinful colors nail polish! Never hear about this box, sounds cool! Bellissimo colore di smalto e bella composizione! Hmm I've never heard about this! Pretty cool that you get to test out these items and see if they work for you:)! An official announcement will probably come in February. air jordan australia Another fresh face and serious Republican contender for the presidency is Wisconsin Gov. Scott Walker, but he has taken the opposite approach to Christie. air jordan shoes australia Like his New Jersey rival, Walker plans to remain as governor while running for president.